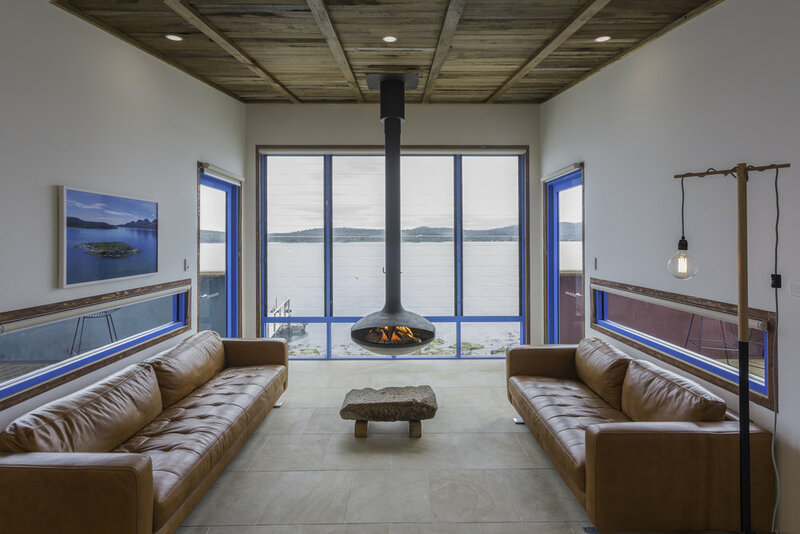 Picnic Island, the latest bespoke retreat to open in Tasmania this year has been nominated for an Australian Institute of Architects award for 2017 under the Small Project category. This little copper clad lodge perches on rocks above the high water mark on its own private island on the Freycinet Peninsula, one of the most stunning parts of Tasmania, a curious island at the bottom of the world (according to Tasmania!). And we’d have to agree, the Design Travel team head there regularly for inspiration – the nature, the food, the wine, and of course, the design, it’s all incredible. Picnic Island was designed by legendary Tasmanian architect, John Latham, the design incorporates multiple decks, living area and sleeping quarters in a compact site which was once a convict sandstone quarry. Sense of place is important here - one of the sandstone blocks found during construction now sits as a hearth under the suspended fireplace. The building of this retreat is a triumph of both planning and practical execution. Nowhere in Australia have approvals been granted for tourism buildings this close to the water and the sensitive design respects the majestic natural environment in which it resides. The building sits below the ridge line and is virtually invisible from shore in Coles Bay and the buildings were sited to ensure the island seabird rookery full of penguins and shearwaters can continue to co-exist with tourist visitors. Every single nail and plank of wood was transferred by hand out to the island using a three metre ‘tinny’, on barges or simply dropped in the water and towed behind the tinny. The logistics and practicalities of building on a little island were hugely complex - as a result the project has been nominated for the Australian Institute of Architects awards for 2017 under the Small Project category.